Corvara, 3 February 2019 – The 2019 Ice Climbing World Cup in Corvara will go down in history as an exhibition of the skills of Russian top athletes. After their triumphs in Saturday’s Speed discipline two ice climbers from the geographically largest country in the world won the stage victory in the supreme discipline of Lead climbing. 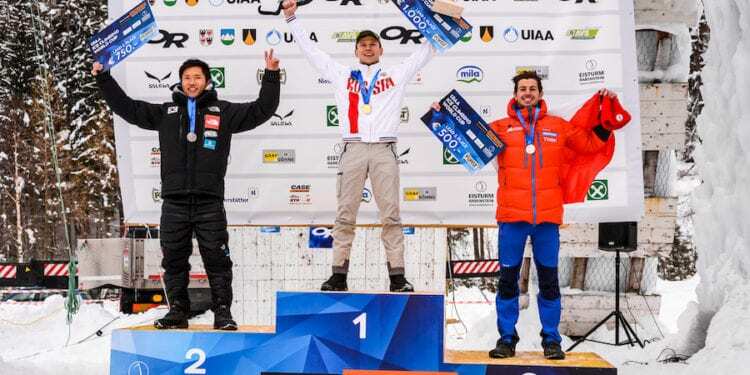 In the men’s race Nikolai Kuzovlev climbed to victory, in the women’s race it was Maria Tolokonina – the two serial winners in the 2018/19 season. The final in front of a good 500 visitors, who despite the current snow conditions in South Tyrol made the long journey to the ice tower in Corvara, could not have been more thrilling. The first to climb to the top was Nathan Clair from France. It took him 6.21 minutes. The next in line was World Champion Heeyong Park. The South Korean was eight seconds faster than Clair and took the lead. 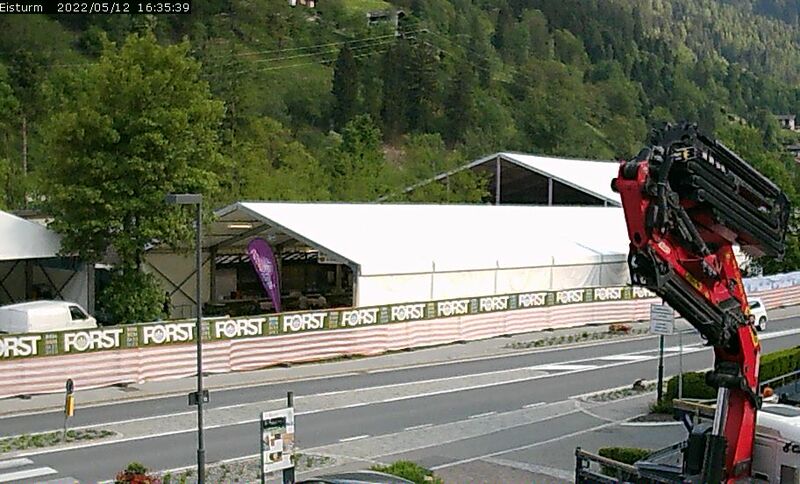 But this was not to be last word in Val Passiria. Because Nikolai Kuzovlev, who was taken from the ice tower by the referees due to a technical mistake in his first attempt, delivered an even better performance in his second attempt than Park. Kuzovlev, who won the Combination World Championships in December in Moscow and who is leading in the World Cup rankings, reached the finish of the demanding route in 5.38 minutes. “I am overjoyed, I love Corvara. Of course I was angry at first, when I was taken from the tower after a technical error. 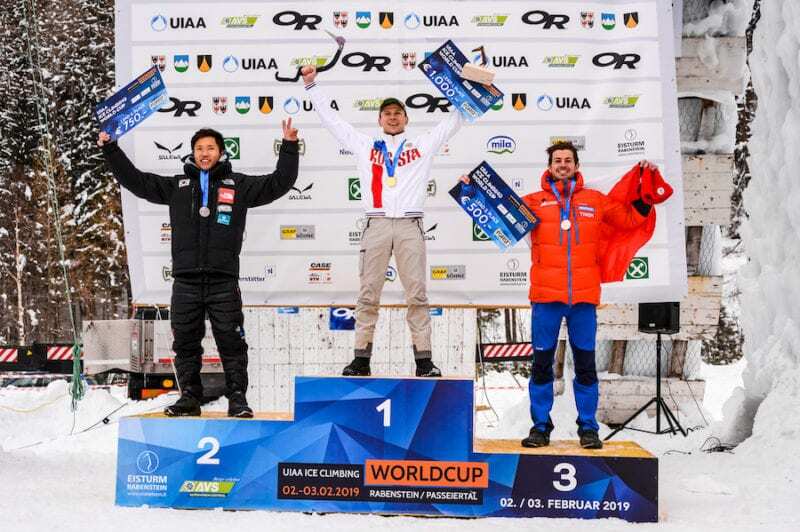 On the other hand, I then knew the first section of the route and could be faster in the second attempt”, Nikolai Kuzovlev commented after triumphing for the first time in the Lead category. In the women’s final eight no athlete made it to the top. Maria Tolokonina got one grip further than her strongest rival, Korean Woonseon Shin. Third place also went to an Asian athlete, Shin’s team colleague and last year’s winner Han Na Rai Song, who just made it ahead of Eimir McSwiggan from Ireland in fourth place. For Tolokonina, who triumphed for the third time this season in the greatest ice climbing competition series, it was the first victory in the Lead category in Corvara in a World Cup. In 2011 the agile top athlete from Russia had already won the “Icefight”, the predecessor to the World Cup. “I love Corvara. I love the nature, the structure, the people, absolutely everything. This weekend was my eighth here in Val Passiria – I’m already looking forward to next year when I’m likely to be at the start again. This win makes me extraordinarily happy”, said Tolokonina, who like Kuzovlev is the reigning Combination World Champion. 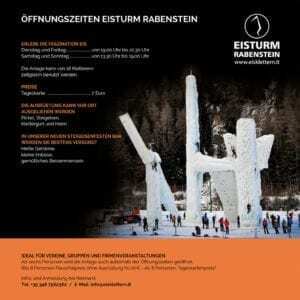 Reinhard Graf, chair of the Organising Committee from the club Eisturm Rabenstein, was also proud of the success of the 7th Ice Climbing World Cup in Corvara: “With all the heavy snowfall, the weather didn’t play ball this year. Nevertheless, we were able to run our event without any problems, because we all stick together in Corvara and can rely on the support of many people. I would therefore like to thank all those who made this event possible from the bottom of my heart: first of all my team, the countless volunteers, the clubs and associations, the Guardia di Finanza Merano who has been supporting us with the athlete’s safety for many years, and many many more. I would also like to express special thanks to the sponsors from the Val Passiria, as well as the public sector, such as the community of Moso in Passiria, which supports us every year”. 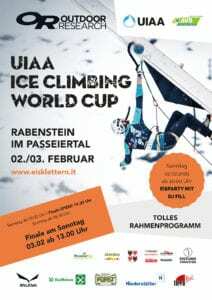 The Ice Climbing World Cup now moves on to Champagny in France, where the fifth stage will be fought next weekend.